Your healthy smile can be beautiful, too. Many people who are unhappy with the appearance of their teeth are not aware of the numerous ways cosmetic dentistry can enhance a smile. Cosmetic dentistry can correct crooked teeth, spaces between your teeth, stained or discolored teeth, chipped teeth, broken or missing teeth and having a “gummy” smile. Let Dr. Landreneau and the team at Creative Dental Studio create a customized treatment plan for you based on your age, goals and where you are financially comfortable. Opalescence Go is the perfect option for patients who are looking for convenient, ready-to-go whitening. A professional whitening gel delivered in prefilled, disposable trays, Opalescence Go can deliver dramatic results in as a little as 15 minutes per day. With no impressions, models, or lab time required, Opalescence Go is the professional alternative to less-effective over-the-counter options and is an excellent introduction to whitening as well as a perfect follow-up to in-office whitening. Think a perfectly straight, dazzlingly white smile is out of reach? 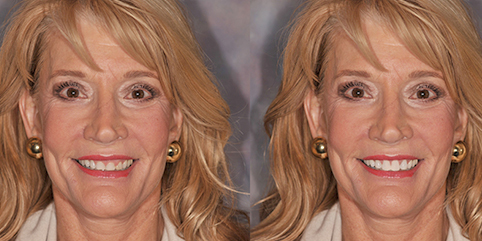 For a dramatic before and after, porcelain veneers may be the answer. Porcelain veneers are thin strips of porcelain that Dr. Landreneau custom shapes and carefully bonds to the fronts of your existing teeth, immediately transforming crooked, discolored or chipped teeth into a brilliant, healthy smile. Because they offer such a dramatic smile makeover, porcelain veneers are often a good solution for quickly treating very crooked teeth, broken or chipped teeth, or even gaps between teeth. Reveal a new and beautiful smile to the world in only a few short appointments. Erase years of wear and tear with porcelain crowns. Sometimes called “caps,” crowns fit over an existing tooth or dental implant post to provide a protective covering for broken, discolored or missing teeth. Crowns made out of silver or gold have long been the dental standard, but it’s now possible to mold crowns out of much more natural-looking porcelain. Porcelain crowns are a durable, often permanent method to restore function to your smile while enhancing its appearance and your self-confidence along with it. Sometimes gum disease, decay or injury results in the loss of a tooth. The missing tooth may cause you to chew differently or compensate for its loss in ways that can lead to significant problems down the road. Dental bridges subtly “bridge the gap” by anchoring over the top of the existing teeth on either side of the missing tooth. Because bridges can now be milled out of porcelain, they’re far more natural looking than their earlier counterparts made of precious metals. Unlike dental implants, bridges do not require oral surgery, but will typically need replacing every 10 to 15 years. Chipped, broken, stained or discolored teeth may sometimes be repaired with bonding, or the application of tooth-colored resin to the surface of the tooth. The process usually requires less preparation of the existing tooth than needed for crowns, and the bonding resin can be sculpted to closely resemble a natural tooth. Repairing teeth with bonding requires less of an investment than the use of veneers or crowns, but is less permanent. Like a natural tooth, bonding resin may also stain with the use of coffee or other discoloring food and drink. Whenever decayed tissue is taken out of a tooth, such as in the case of a cavity, the remaining space requires a filling to maintain the proper structure. For many years, fillings were silver-colored and, while perfectly safe and effective, they were very noticeable. With advancements in dentistry, you can now enjoy discreet, tooth-colored fillings instead of traditional silver fillings. You may even elect to remove your old silver fillings in favor of new, undetectable tooth-colored fillings. Does your smile reveal more gum tissue than you would like? Many people are unaware that it’s possible to cosmetically enhance the appearance of “gummy” smiles. Dr. Landreneau can give you a more aesthetically pleasing smile by reshaping and sculpting gum tissue, using a laser to minimize recovery time. This procedure can make a dramatic difference in the look of your smile, especially when combined with other cosmetic dentistry. Look younger by lessening the appearance of facial lines and wrinkles. In addition to treatments designed to give you a beautiful, youthful smile for life, Creative Dental Studio makes Botox® treatments available to you. A single Botox® treatment effectively “erases” fine lines, especially around your brow area, giving your face a tighter and more youthful expression safely, conveniently, and comfortably. Enjoy a Botox® treatment alone, or schedule one with your next cleaning or cosmetic dental enhancement. Everyone’s skin ages differently, and JUVÉDERM® XC may be used to rejuvenate multiple problem areas. From smile lines to vertical lip lines, you can smooth away unwanted wrinkles and restore natural contours. JUVÉDERM® XC is the smooth gel filler that Dr. Landreneau uses to instantly smooth away wrinkles around your mouth and nose. With just one treatment, you’ll get smooth, natural-looking results that last up to a year. If you experience anxiety related to dental procedures, Dr. Landreneau can prescribe oral sedation options to take prior to your appointment and reduce or eliminate your stress.